In 1738, Charles III of Bourbon began the systematic excavation of the ancient city of Herculaneum. The news of the discovery had such an echo that curious tourists from all over Europe decided to come and see the ruins. At that time, many Neapolitan aristocratic families, in order to be close to the king and to his glory, decided to build beautiful villas near the Royal Palace that the Borubon family had built in the town of Portici. The stretch of road which is dotted with beautiful villas, that are considered to be real architectural jewels, is now called the Golden Mile. 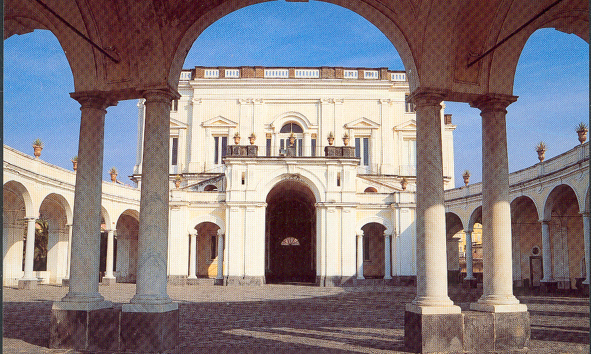 The tour starts from the beautiful Royal Palace of Portici. Built with the intention to host the relics found during excavation works of the ancient city of Herculaneum, the Royal Palace of Portici is now home to the Faculty of Agriculture of the University of Naples and it hosts also an important botanical garden. The tour will continue along the Corso Resina for a walk in the public gardens, and after looking at the ancient ruins of Herculaneum from above, we will visit Villa Campolieto, a masterpiece built by the famous architect Luigi Vanvitelli.